Superintendent Christopher Mominey prepares to Skype from St. Peter’s Square with students in Central New York. 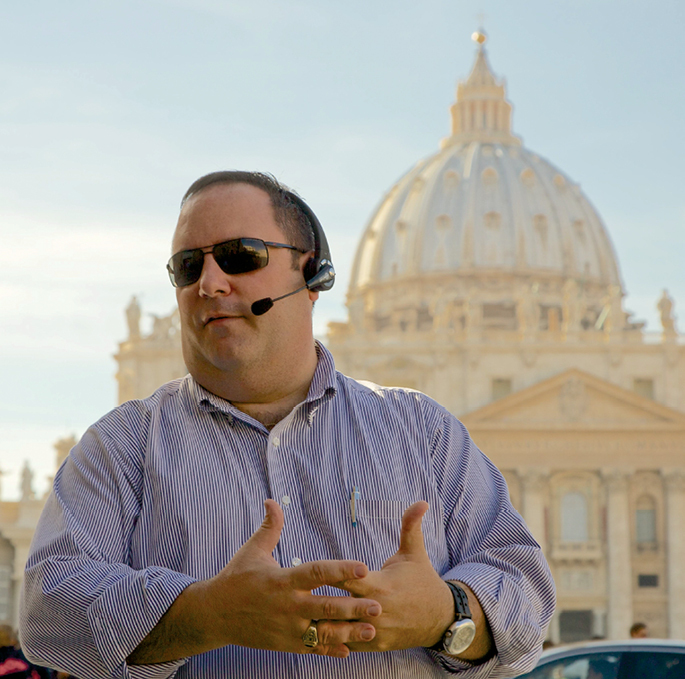 Standing in the middle of an ancient city full of history, Catholic Schools Superintendent Christopher Mominey used some of the most modern technologies to send the experience of a canonization in Rome, Italy, home to students in the diocese. “Hello St. Margaret’s!” he greeted the 5th and 6th graders with a wave, the dome of St. Peter’s Basilica peeking over his shoulder. Using a wireless Internet connection, an iPad and Internet-based video messaging platform Skype, Mominey was able to chat in real time with not just St. Margaret’s but every school in the diocese from St. Peter’s Square. When the canonizations of St. Marianne Cope and St. Kateri Tekakwitha were announced late in 2011, Mominey said the wheels in his mind started turning. Two women with roots in Upstate New York — St. Marianne, a Franciscan nun who was born and worked in the diocese before moving to Hawaii to minister to people with Hansen’s disease; and St. Kateri, a 17th Century Mohawk convert to Catholicism who was born near what is now Albany — would become saints of the universal church in an October 2012 ceremony at the Vatican. Mominey, teachers and Catholic Schools staff put their heads together. A plan began to take shape. First, a thick binder full of information about St. Marianne, the Franciscan order and its spiritual roots in the town of Assisi, and St. Kateri was developed and distributed to teachers throughout the diocese, along with instructions to incorporate the information into classroom lessons. Then, in the weeks leading up to the canonization, Mominey and Diocesan Director of Educational Technology Dominick Lisi started filming a series of short educational videos. The videos were uploaded to YouTube and shared on a Facebook page created especially for the project. One of the first videos took students to Utica to learn about St. Marianne’s childhood and to visit her home parish of St. Joseph-St. Patrick. As the canonization drew closer, Mominey and Lisi traveled to Italy, where they filmed additional videos about Assisi and the Franciscan tradition, Rome and its spiritual and historical significance, and on the process of becoming a saint. While in Rome, Director of Educational Technology Dominick Lisi and Superintendent Christopher Mominey record video about the canonization of St. Marianne Cope. 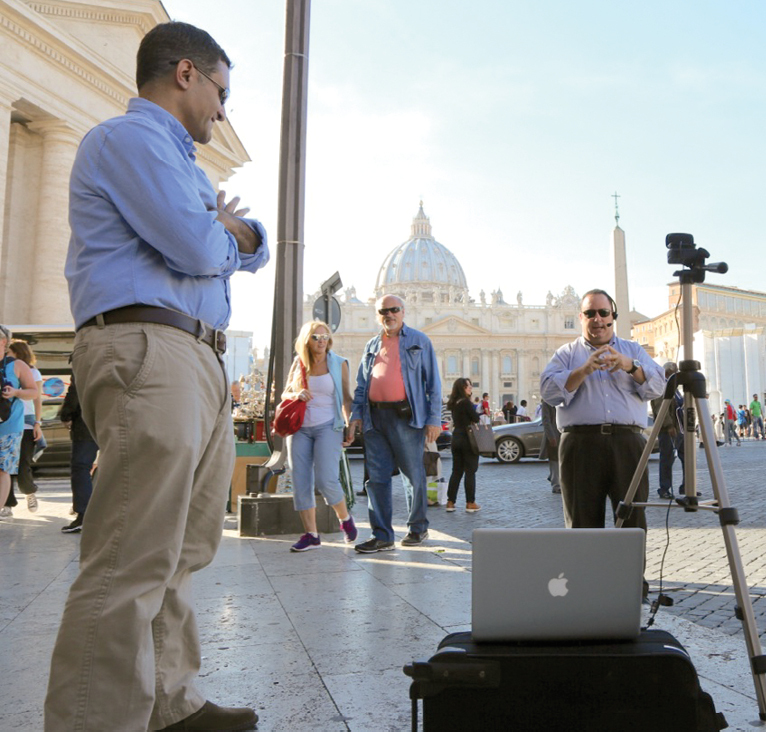 Finally, just days before the October 21, 2012, canonization, came the culmination of the project: live video chats with students in the diocese from the outskirts of St. Peter’s Square. Outfitted with a wire­less microphone headset and standing square in front of the iPad’s web cam, Mominey started dialing up schools back in New York. Over the course of three days, he held individual 30-minute Skype lessons with students from each of the diocese’s 22 schools. His chats included a brief history of the square and some of its most prominent landmarks, including the massive obelisk that stands at its center. He taught students about its origins (a trophy the Emperor Caligula brought to Rome from Egypt), how it came to stand in the square (moved by horses and hoisted by pulleys at the Pope’s request) and even its weight (1 million pounds). Fellow 6th grader Damion Douglas also declared the Skype session “great.” “I liked seeing the cars driving around in the background and having Mr. Mominey point out all the places where the ceremony happened,” he said. There were also a few special guests at a number of the lessons. Diocesan Director of Communications and Assistant Chancellor Danielle Cummings stopped by, as did Rev. John Manno, pastor of St. James in Syracuse. Diocesan seminarian Chris Seibt also took a turn at the mic, answering St. Margaret’s questions about relics and whether the Sign of the Cross is made the same way in Italy (It is!). Mominey said the whole experience, which went off with no technical difficulties, was extremely rewarding. “I love teaching, and to be able to do it in a way that is fun and appealing to the students was a blessing,” he said. The project was sponsored by multiple partners, including the Sisters of St. Francis of the Neumann Communities, Smart Tuition and retired Bishop of Syracuse James Moynihan and would not have been possible without the support of Bishop Robert J. Cunningham, according to Mominey. He hopes to expand the project into a larger curriculum for use both inside and outside the diocese. Videos and photos from the project are available on the “St. 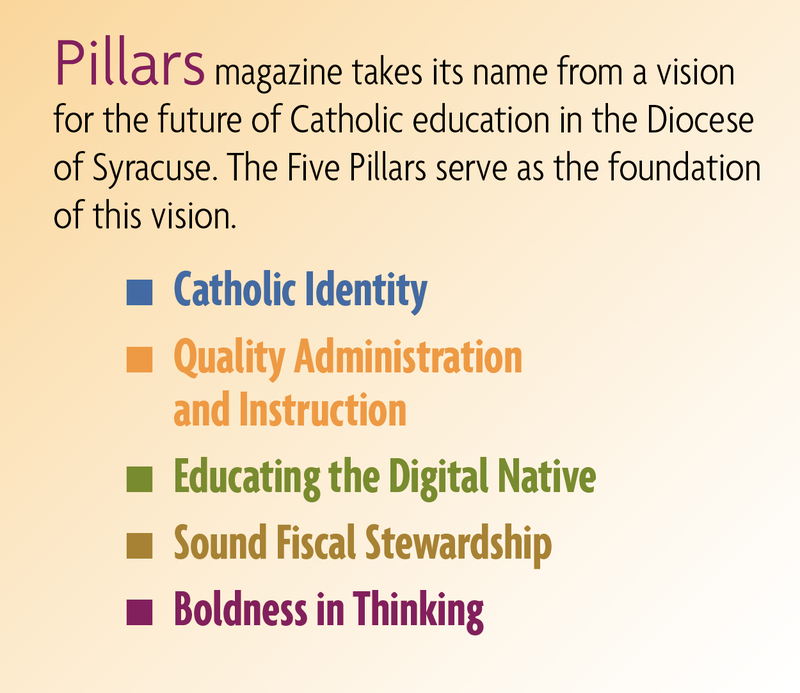 Marianne Cope – Syracuse Catholic Schools” Facebook page, and more information can be found on Mominey’s blog at www.diosuptmominey.wordpress.com.